You Are Here: Home > Products > Furnace & AC Filters > By Brand > Honeywell Air Filters > Honeywell Return Grille Replacement Filter > Honeywell Return Grille Replacement Filter FC40R1060 16" x 25"
Honeywell Return Grille Replacement Filter FC40R1060 16" x 25"
NOTE: Honeywell is now making this filter in 3" depth (formerly 4-3/8"). They have increased the pleat count on the filter to match the performance of the old design. Replaces older Honeywell model number F35R. 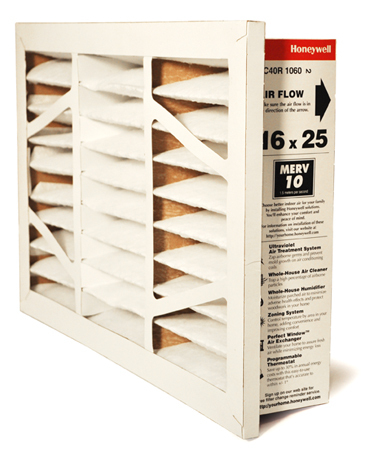 Honeywell recommends changing your filter once a year. It may be necessary to replace it sooner depending on the conditions in your home.
. 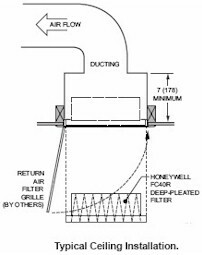 Mounts in most third party return filter grilles (features integral gasket around upstream side of filter).
. Provides high-efficiency alternative to one-inch filter.
. Captures particles as small as 0.3 micron.
. Pleated filter for greater media capacity.
. Easy installation. 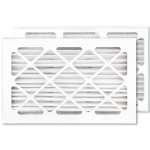 Pre-assembled filter easily inserts into and out of existing return grille.
. Exclusive frame design nests properly into place.
. Low pressure drop reduces strain on equipment, provides a comfortable air flow and maintains equipment efficiency longer than standard filters.